(L-R) Gov. Bert Combs, Pres. Martin, and David Pritchett (finance commissioner). See pgs. 1 & 5 of Feb 22, 1963 Eastern Progress for an article on this event. GROUND-Breaking: Gov. Combs, President Robert R. Martin, and finance commissioner David Pritchett were among the many notables participating in ground-breaking ceremonies today at Eastern Kentucky State College. Ground was broken for two 12 story men's dormitories costing $2,850,000 a new classroom building that will cost $2,900,000 and an addition to the John Crabbe Library, to cost $1,000,000. 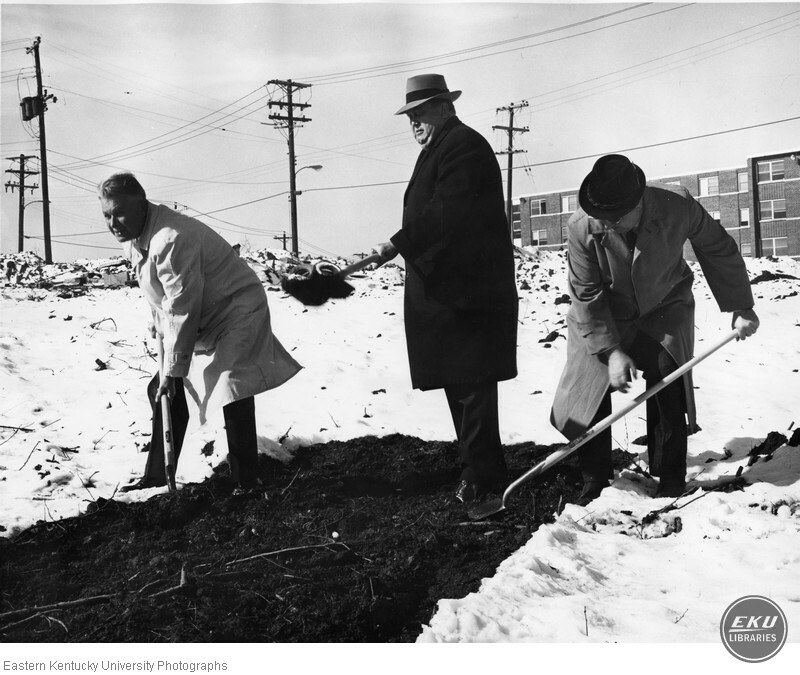 “Groundbreaking for Todd and Dupree,” Digital Collections, accessed April 25, 2019, https://digitalcollections.eku.edu/items/show/36552.